I find it to be a major failing on the part of this website that we have written very little about The Muppets since we’ve launched. Now, granted there’s been very little to actually report on beyond some popular YouTube videos and rumors of a Jason Segel-written movie off in the distance. That movie has been talked about for so long with no news of it receiving an official green light that I had come to assume it would never happen. That was until today when it was reported on the Muppets official Facebook page (what? 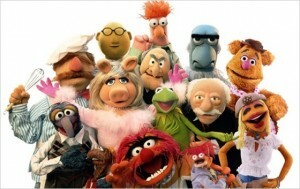 You don’t follow the Muppets on Facebook?) that the movie is already filming and that Entertainment Weekly was publishing an exclusive sneak peak.